Before digitally collecting the data, how did you do it? Each field officer had a box of paperwork with specific files, which they would fill in manually and then enter the data on to the computer system. Then we introduced our tablet app, on which we have compiled all the different forms needed by the field officers to collect the data. Moving from a paper-based data collecting system to one that it electronic has had a really positive impact. We are getting accurate information, and at a faster rate. The data is stored in our Excel database and from there, is published online. It is open source data so we share the information with ministries or other organisations known to help small-scale farmers. How many field officers are we talking about? We have eight field officers and the workload is high because we have registered almost 2,000 farmers and 700 organically certified farmers. These farmers are visited every year, which is not easy because unlike in Europe and other places, there are no street names or house numbers to find the farms. With the paper-based system, we used to have to stop several times just to ask for the directions. Now, thanks to CTA, we have a GPS system that gives the desired farm location. How did CTA help you to move from paper to digital data collection? Our application was predominantly funded by CTA so without them, there would be no technology. To see the faces of our farmers when we bring the digital device out into the farms is overwhelming. They ask, “Can we have a look at it? Can we touch it? Can we play around with it?” All these small impacts are so big in reality for the farmers. What services do WIBDI provide? Our Farm to Table app connects the farmers to the market, the market to the tourists and the tourists to the farmers. The main idea is to ensure farmers’ products actually reach the hotels and restaurants, as opposed to being used for home consumption. Therefore when tourists first arrive in Samoa, we introduce them to the app at their hotel or at the airport, and through it, they can chose where to dine or where to purchase organic products supplied by the local farmers. The tourists are told the background of the farmers providing the products to the restaurants, which delivers a very different experience. Do you think WIBDI could replicate its model outside of the Samoa? WIBDI works with 13 Regional partners in the Pacific and one of our main successful projects is with the Solomon Islands, where we work with an isolated island on the western province called Simbo. Our work with the community of Simbo started in 2012. WIBDI staff were introduced to the project and have travelled to Solomon Islands particularly to be in Simbo from year after year to train, to nurture, to build the village community's capacity in the production of virgin coconut oil, handicraft carving and printing of materials using their own designs, as well as sharing our expertise with the local community to empower women, men and children in their roles within the community. Following WIBDI’s introduction and providing capacity building to Simbo, the whole community became empowered and took control of everything that matters in developing their small island, and being able to gain organic certification in 2017 after its first organic international audit conducted by the NASAA inspector from Australia. Simbo has become the first Island on Solomon islands to become organically certified through third party certification after WIBDI introduced Organic farming practices, production processing, marketing access capabilities and introduction to new range of products. The women’s committee have established their own Organisation to manage the facilitation with markets and certifying agents and take control of the processes post project funds. This is a very important milestone for the whole community of Simbo. 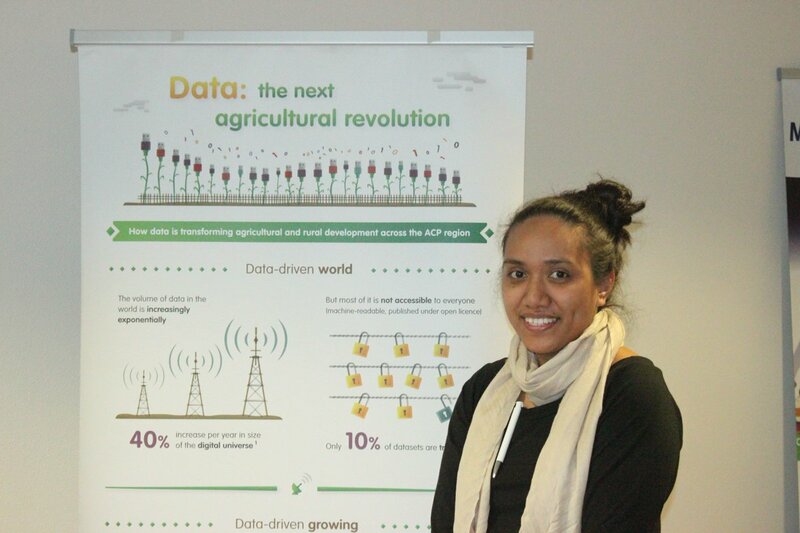 CTA recently organised the Data4Ag week in The Hague in the Netherlands. What did you learn there? The workshop was very interactive and everything we talked about related to the work I am doing back home. The data we are collecting has a voice, it is not just a bunch of numbers and words. And it is not just Samoa that needs data, but the whole world – everything we do is information-related. The workshop was also a learning experience for me because my background is not really data related!